14.6" x 15.1" x 3.5"
Expect reliable everyday performance from your desktop printer, even when dealing with the unexpected. Choose the robust RICOH Aficio SP 3510DN for high-quality monochrome output at minimal cost. With efficient 30 page-per-minute output speeds, a fast warm-up time and an easy-to-view 2-line tilting LCD control panel, these printers are excellent choices for corporate workgroups, small businesses, and home offices with 8.5" x 14" monochrome printing needs. A choice of manual or automatic duplexing plus Ricoh's ultra-reliable All-In-One print cartridge technology rounds out the Aficio SP 3510DN rich feature set to easily meet the needs of cost-savvy businesses and professionals. Efficient 30-ppm black & white output speed at 600 x 600 dpi and 1200 x 600 dpi resolutions. True 1200 x 1200 dpi resolution (at 50% speed) for superior halftone and grayscale reproduction. Powerful 295 MHz print controller quickly processes every file. Standard 64 MB RAM quickly handles incoming data streams in popular PCL 6 or PostScript 3 emulations to keep the pages flowing. Built on Ricoh's proven All-In-One (AIO) print cartridge technology for maximum uptime, consistent image quality, and ease of use. Fast 20-second warm-up time for near-instant readiness and 8-second first print speed for quick job turnaround. Network-ready with standard 10/100Base-TX Ethernet plus USB 2.0 Hi Speed interfaces. Tilting 2-line LCD panel for improved operability, supply status display, and fault communication. Latest Windows and Mac support plus UNIX Filter and Citrix tools for host- and distributed-print workflows. Standard 250-sheet Paper Tray and 50-sheet Bypass accept stocks in size up to 8.5" x 14" and up to 90 lb. Index in weight. Add one 250-sheet Paper Feed Unit to raise capacity to 550 sheets. 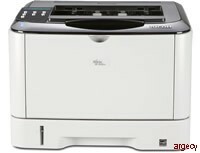 The SP 3510DN offers built-in automatic duplexing for productive two-sided printing. The more economical SP 3500N supports manual duplexing. Familiar device management through Web Image Monitor plus new Printer Driver Packager NX support. 14.57" x 15.43" x 10.41"